Marim Daien Zipursky Marim is one of our newest members. She joined the gallery on October 1, 2017 and we are pleased to include her work in the gallery. Marim is a long-standing member of the Winnipeg Arts community; an impassioned advocate of art and culture; and a creator of art. Her fascination with clay began as a young adult, and her commitment to the art form was enhanced in local art classes and workshops. Feeling inspired and encouraged by those experiences, Marim returned to the University of Manitoba, where she had previously received her BFA Honours, immersing herself in ceramics classes and in the ceramics community for four years. She has maintained a studio ever since, exhibiting and selling her work in Manitoba and Prince Edward Island. Marim is best known for her sawdust or smoke fired vessel forms, inspired by the human body. Her creative process begins on the wheel, and the clay is then altered, carved and burnished to achieve the desired shape and surface quality. These pieces are primarily without traditional glazes, but not without colour or pattern. 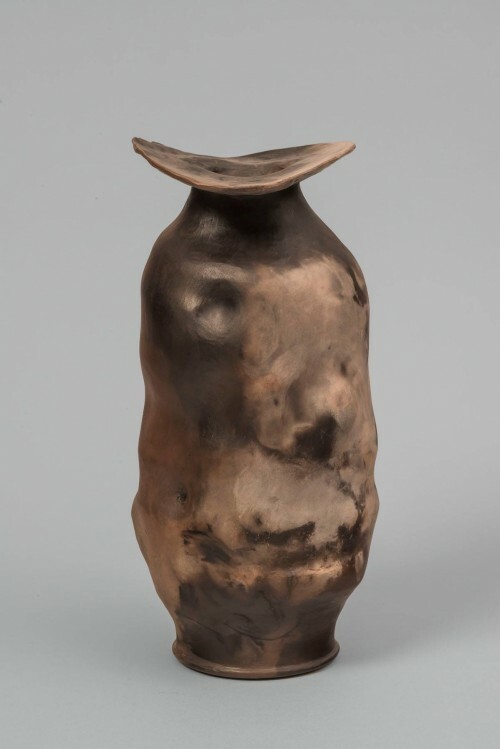 She uses oxides and organic material in this alternative firing process to create surface interest. Marim continues to be inspired by the many options ‘mud’ offers her and enjoys experimenting with diverse firing processes, creating functional and non-functional wares.